i've actually shared these shots with you previously. 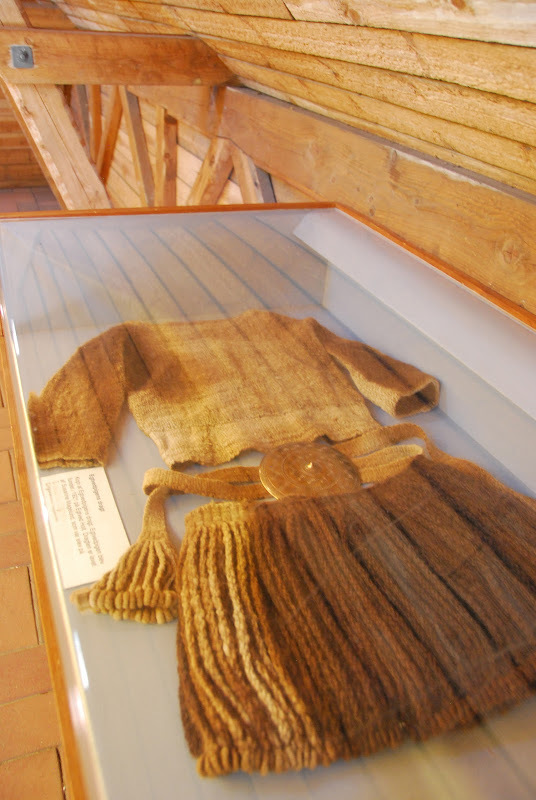 but i just learned that back in september, this replica of the egtved pige's (egtved girl) clothing was stolen from a display at her grave near egtved (a little town not too far from where we live). it's a copy of the clothing found on her that was painstakingly reconstructed in 1980-81 by susanne magelund, using the sort of materials and methods that the original garment had been made of. i think it's magical that there are groups of volunteers who have both the notion and the guts to take on such a project. the original dress, which is safe in the national museum in copenhagen is 3300 years old and one of the best-preserved textiles of its kind ever found. it's pretty awesome that a group of people with equal measures of passion and curiosity want to undertake duplicating such an amazing garment. but boo to those jerks who stole it. i suppose they thought it was the original and would be worth a lot of money. i imagine when they found out it wasn't, that they callously threw it away somewhere. it's such a shame. What color Converse All-Stars will you wear w/ this mini skirt? that is an EXCELLENT question. i have brown ones, but they may not be quite the right shade. Time for a pair of high Dr Martens boots my dear!